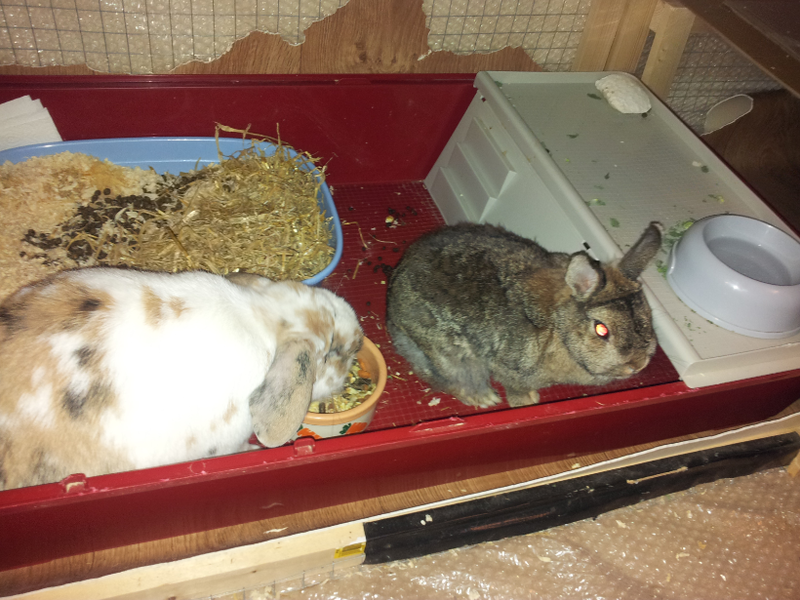 Two of our rabbits eating. The red area is the remains of Banacek’s first hutch, and takes up 1/6 of their overall hutch size. 1. Rabbits are fibrevores. This means that they are herbivores (vegans) who eat grass. Cows are another example of a fibrevore. Your pet rabbit needs 24/7 access to hay, even if he has an outdoor run with grass. If he’s got no hay, he will get sick. Grass and hay are the ideal combination, but the water content in grass will give bunny diarrhea if he’s only getting the fresh stuff. They also like snuggling in hay – they prefer it to sawdust. It won’t look like a carrot when it comes out of the other end, and you shouldn’t feed them carrot tops either. I was trying to show continuous digestion, not the changes to the food that take place. 2. 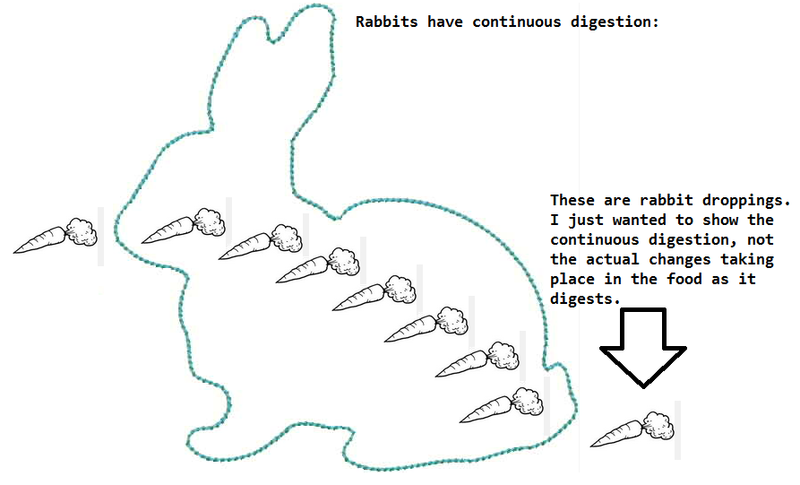 Rabbits have continuous digestion. This means they basically have a constant queue of food in their digestive system (see diagram). If they don’t have something to eat available to them 24/7, their digestive system goes to a standstill. This is called digestive stasis. Once they go into digestive stasis, it is very difficult to get their system to start again, and many rabbits die from this. Just to clarify, there’s no time limit on when it’s classed as stasis, but as a rule I would say if your bunny hasn’t eaten anything for six hours, they probably have stasis. Call a vet for advice. Top right is their bowl of water, left is their food bowl, surrounded by bunny nuggets. 3. Most rabbits don’t actually like water bottles. I previously had dogs, before I had rabbits, and I give all six of my rabbits a choice – I put a water bowl and a drinking bottle out. I have the space to do this because they are all housed in very large areas. Drinking bottles are now marketed as “safer” for small animals, but guess what? When they lived in the wild, they drank from ponds and puddles all the time and they never drowned!!!! Bottles were basically a lab-originated concept and aimed at rabbits kept in confinement with no quality of life. My rabbits all prefer their water bowls, none of them use the bottles even though three of them used a bottle for eight years before they came here. Yes, bowls can get full of hay and bunny fur, but you should be cleaning their food and water bowls (and/or bottle) every day anyway (or any pet’s bowls, for that matter). It’s good hygiene. Would you want to eat off the same plate for a week, or drink from the same cup for a week, without washing them? If so, perhaps you should consider NOT getting a pet until you’re mature enough to treat them right. 4. 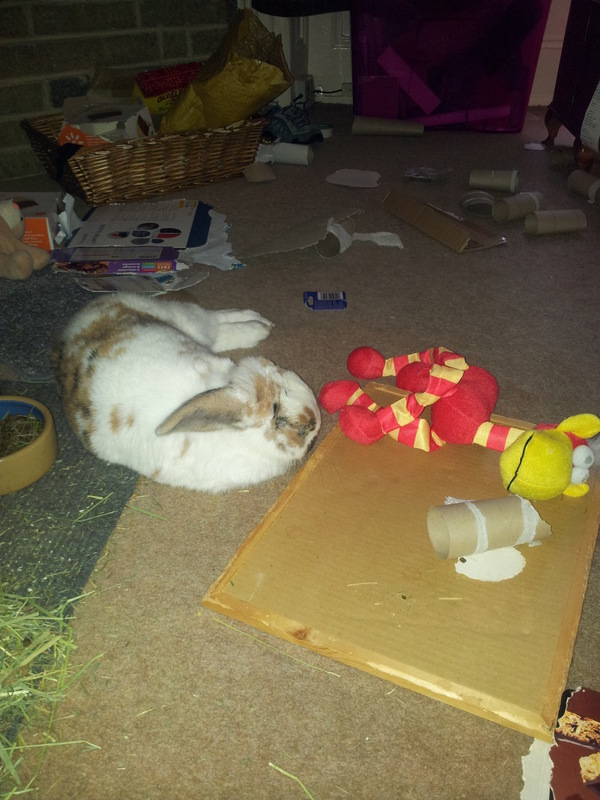 Rabbits make a mess. They aren’t like dogs, who leave dog mess everywhere for six months then become model citizens. Rabbits are generally highly litter trainable. The mess with rabbits is more general – their food ends up everywhere when they bury their faces in their bowls, their water can end up everywhere when they sit in it, their fur ends up everywhere (just like dogs and cats) and when you give them toys, they will probably destroy them. If they destroy the toys you bring them, don’t get upset. Did you buy the toy for them to enjoy, or to look pretty in Instagram bunny pics? You will notice that almost all of my photos and videos have some mess in them. There’s food on the floor, the occasional bunny poo (when they sleep they sometimes poo, so obviously when they don’t fall asleep in the litter tray their poo ends up on the floor, also around the litter tray sometimes, if the rabbits are sharing space, they will poo to mark their territory sometimes as well), bits of cardboard, stick and newspaper that they’ve nibbled… if you want a tidy house, you would have to spend your life following them round with a Dustbuster and constantly making your house devoid of signs of rabbits. If this is you, get a different pet. Don’t take away what is theirs just because you have an idealistic concept of what a house should look like, it’s not fair. If you did that to a child it would be cruelty. On the other hand, do keep it as hygienic as you can. I sweep up all the food/poo messes twice a day and vacuum every few days to keep it all fresh. 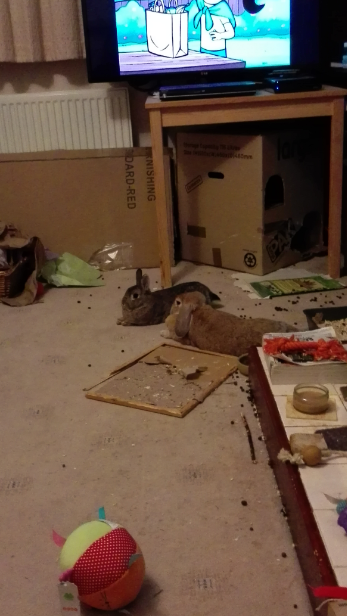 These rabbits like to make a mess! a) Playing “chew”: Rabbits explore everything with their mouths. To a rabbit, chewing things is the absolute most interesting thing ever, and they love to chew anything. It’s like their sixth sense – sense of chewy. Their teeth constantly grow and they need to nibble. Give them plenty of hay, cardboard boxes (some rabbits like Conflake-type boxes, others prefer the corrugated cardboard boxes, some like to go in the middle and chew shoeboxes), packing paper (never polystyrene or anything plastic coated), and perhaps a catalog or two. In the UK we have a store called Argos and it’s catalog is 2 inches thick. Bunnies love that. Also, this is a great use for any unwanted copies of fad books such as the Da Vinci Code or 50 Shades of Grey. Rabbits aren’t picky about the words, they just love to chew the corners off of books. I recently gave Banacek and Cleo a book called “Ancient Beluchistan” from the 1970s, that I got from a free book stand. It was cloth bound and had old yellowing pages, and they just pounced on it. 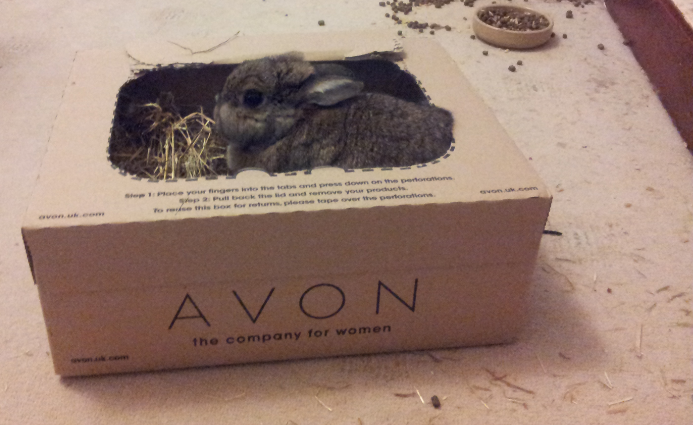 Rabbits also like to chew their cardboard into projects, so if they do chew big holes in the cardboard boxes you’ve given them, it’s ok, they’re probably making it into a fortress so they can run around it a lot later. Leave them these chewed up boxes for as long as possible – they will get upset if you keep throwing their toys away every time they play with them. b) Playing “chase”: Almost as important to rabbits as chewing is running. Rabbits love to practice this skill during “peacetime” (when their herd isn’t threatened) by playing chase. When you have one rabbit on their own, they will play chase with you. When you have more rabbits, they generally play chase with each other. This is because they’re faster and more maneuverable than you (sorry) so they get to practice their running away strategies more effectively. An important skill for you to learn is how to tell whether they’re enjoying a game of chase with you (or another rabbit), or whether they think you or the other rabbit is an actual predator and are panicking. There can be a fine line. I often augment chasing with cheerful talk, because it reassures the rabbit about where I am and what mood I’m in. Rabbits know your emotions by the sounds you make (how your voice changes) so keeping a cheerful narrative in a calm or loving voice keeps them knowing it’s a game. I like to say things like: “I’m chasing you! Chase chase chase the bunny! I’m gonna catch you and put you in a pie!” In a warm tone of voice so they keep enjoying themselves for longer. They will purposely stop at certain points to let you catch up. If I actually catch them, I never pick them up (they hate it). Instead, I stroke their nose very gently, or their back (but not the tail) and tell them what a good bunny they are. When they associate being chased by you with a positive outcome, they enjoy it more and will play for longer. One rabbit who I was babysitting for a friend took 2 days to understand the concept of play-chasing, then she loved running in circles, then she would get tired and lean on the wall to catch her breath. I started stroking her. She liked it so much, she just stood there for 20 minutes letting me stroke her. Her fur was a LOT softer when I gave her back at the end of two weeks. A toy that has been played with a LOT by four rabbits who all like to play chew. It’s still bunny safe because it’s made of 100% rivergrass. This was a good buy and has hours more fun left in it. 6. 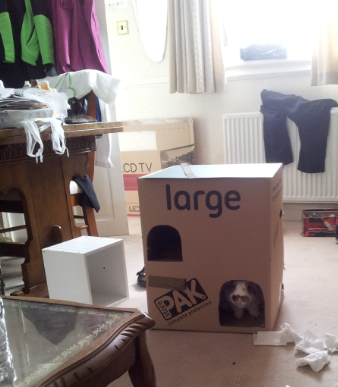 Rabbits have strong concepts of territory, privacy and (after a few weeks) entitlement. Decide right now which rooms you don’t want bunnies going in. Is there ant powder in the kitchen? Exposed wires in your bedroom? Are you going to clean these up and bunnyproof everything in the house, so they get all-areas-access? 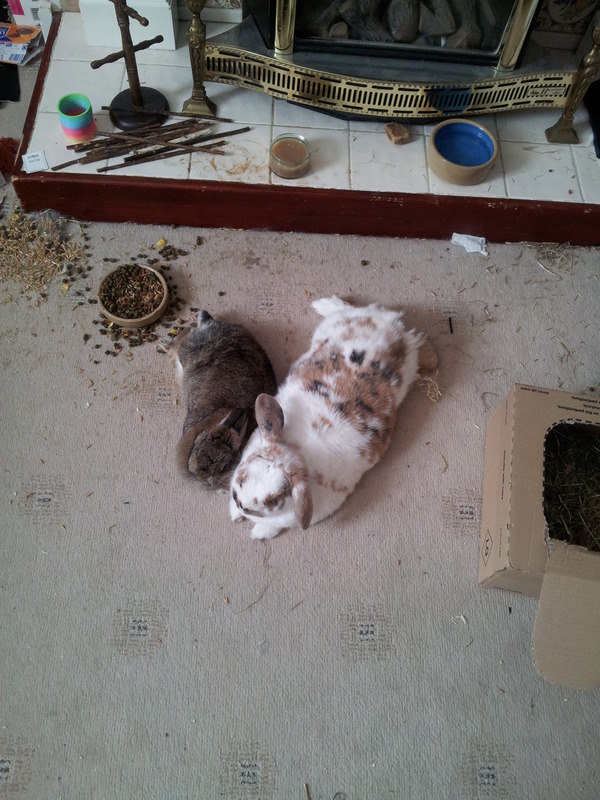 Or are you going to bunnyproof one or two rooms and let them spend most of their time there? In every house we’ve lived in, there have always been rooms that were off-limits to bunnies. This was usually for safety reasons – we couldn’t stop bunnies getting under the tumble dryer or kitchen units, for example – although there were other reasons too – Banacek seemed to think the entire bathroom was his litter tray (we suspect the previous tenants had missed the toilet a lot, and that Banacek was merely trying to claim this land for his herd), so once he was litter trained we gradually moved his actual litter tray to outside the bathroom (with the door kept closed) then to the top of the stairs, where it remained until we moved out. He hasn’t behaved like that in the new house, and only uses his litter tray unless he’s asleep. Cleo has claimed this pile of hay as her territory. Banacek gets to nibble it as well, because he’s her partner. But no-one else. Excepting if they ask nicely. 7. Rabbits don’t separate your property from theirs. 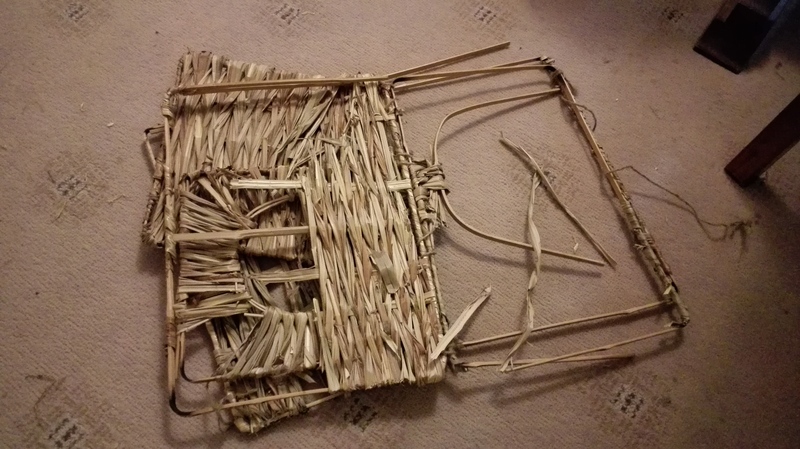 Rabbits assume that all property in their territory is communal; they would share their cardboard with you in an instant, and expect you to share your delicious hairdryer wire, shoes, bags, wicker storage baskets and decorative sticks etc. If you don’t want something to get chewed, put it out of bunny’s reach, and remember they stretch tall. 8. Rabbits can use their environment and think sequentially when they want to. Here’s an example: I put a sunflower on a table where the rabbits couldn’t nibble it. 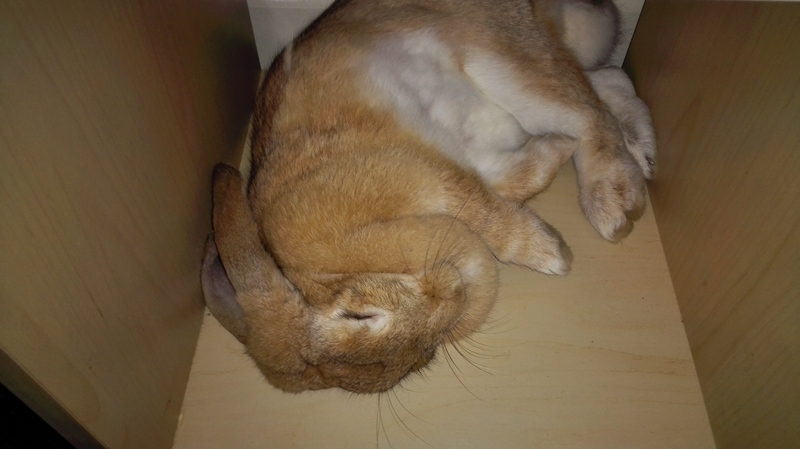 When playing chase the bunny with Banacek, he went under the same table. I had to push the chair out to follow him. When he dug himself into another spot, I left him to it and went downstairs. Twenty minutes later, I thought I’d better check on him. I went upstairs and found him standing on the table, chewing the last sunflower leaf off the stalk. When I came towards him, he jumped straight down, I thought, “he knew he was doing wrong but he did it anyway.” When I told my OH about this, he said “he probably just got scared that you were stomping towards him, saying his name in a scary way, and ran away.” Bunnies get scared a lot. But how did the rabbit know there was a sunflower up there??? 9. Bunnies get scared. A lot. Sometimes the silliest things will scare bunnies. Katie and Fifer are well known for panicking and stampeding when I move my feet after sitting still for a while. Their regular sitting spot is six feet away from my chair. Katie is especially skittish. I guess we will never know what happened to her before she came to live with us, but I have a feeling she got kicked more than once. Unfortunately, once they’re scared of something (especially if they have decided you were responsible for some reason) it’s near impossible to un-scare them. They will literally tear themselves apart or break their own legs to get away from a perceived danger. Think of rabbits as that really cool friend you have, who also has occasional anxiety attacks where nothing will calm them down. The best thing to do in this situation is leave them to it until they calm down. Then stroke their nose. Katie asleep in a cupboard. When rabbits get scared, they hide in small, hard-to-reach places. 10. Rabbits need the security of their own place. Whether they’re an indoor or outdoor rabbit, they need somewhere to live. If you dislike those indoor cages, get an outdoor hutch from the pet store and put it in your living room. It’ll look like a piece of antique furniture. I did this with Katie and Fifer while we were settling them in – we knew they would probably live outside eventually, but for the time being, they were indoor bunnies, so we got them a 2 story hutch that was five feet wide and four feet tall. It was varnished and made of quality wood, and it looked really nice when it was in the house, and made the living room look a lot tidier than when we had Banacek’s metal indoor hutch in the living room. Don’t worry – they never spent more than nine hours a day closed into their hutch – they either were let out when we got out of bed, or they were put straight outside to their rabbit run which had a smaller hutch for shelter (we leave the door open on that one); the run afforded them much more play space. We have recently moved them into a large brick outhouse, their hutch has moved with them and we unscrewed and removed one of the hutch’s doors so they can always access all of their new space. Once rabbits are settled in a particular hutch, unless there’s a safety or welfare concern, it’s best to keep that hutch with them wherever they go. It’s their nest. 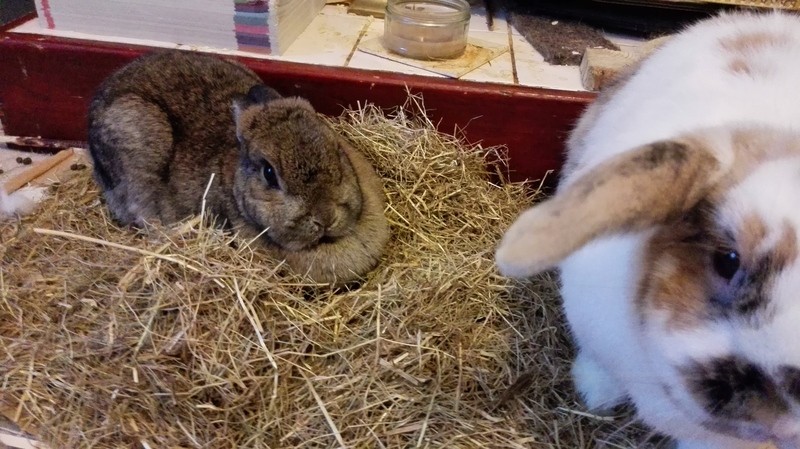 Sebastian and Neville, our 100% outdoor bunnies (they hate indoors, they only get brought in if they’re ill and need round the clock care), had a smaller hutch that their previous owners had kept them in. They love this hutch, and while we wanted them to have a more warm, secure outdoor space due to them always being outside, we also wanted them to be able to call it home. We took the front off their old hutch and put it inside their new one – a large shed with hay insulation – so they have a lot more indoor space for those cold days when they don’t want to play out, and so they don’t have to make their old hutch damp or muddy if they’ve been out in the rain. They also have 24/7 outdoor access, as do Katie and Fifer now that they live out of the main house. The sense of security a rabbit gets from feeling like they own a particular place is very important to their well-being. Even if you never want to close your rabbits inside a hutch for the night, make sure they have a hutch that belongs irrefutably to them (you can take one or all of the doors off for them, if you like). Our rabbits are free to roam the house and garden but they all have their own rabbit housing and they can always access it. All that cardboard? That’s his toys.